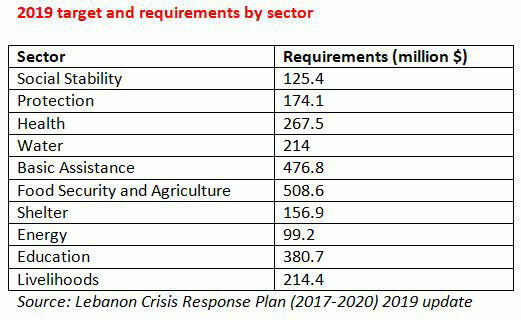 The 2019 Lebanon Crisis Response Plan (LCRP) calls for $2.6 billion for the provision of direct humanitarian assistance and protection of highly vulnerable people in the country. Around 40 percent of the needs that LCRP covers are for basic assistance, food security and agriculture, according to the LCRP updated 2019 report. “There will be no funding for the Syrian refugees crisis in the coming budget,” said Prime Minister Saad Hariri, on Thursday, when the report was unveiled. The LCRP is supported by 133 donors including the UN and NGOs. Last year, LCRP partners support reached $1.1 billion, around 41 percent of the total needs of $2.7 billion for Lebanon in 2018, according to Hariri. Since 2011, Lebanon has received more than $6.7 billion in support of its crisis response, according to the report. Lebanon will receive $563 million in aid from the UN this year, according to the updated UN Global Appeal 2019 report, which was released in December 2018. The UN’s 2019 aid for Lebanon is 22 percent larger than the preceding year’s support, which totaled $463 million, and was dedicated to the agency’s cash assistance initiatives for refugees and vulnerable locals, such as the food e-vouchers program. Lebanon’s aid represents 20 percent of the UN budget for MENA.